Beer lovers – now that I have your attention – let’s talk water. 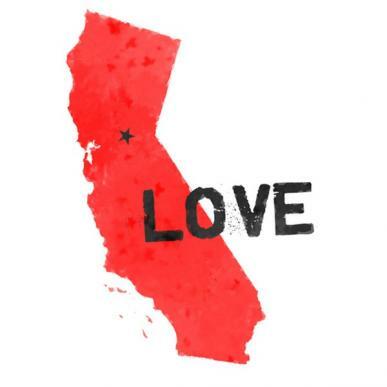 Nowhere in the country is water more critical an issue and looming risk than in my home state of California… critical to farmers, utilities, businesses, and yes, even breweries. The current drought has brought a host of challenges for our growing state, including more wildfires, collapsing delta ecosystems and fisheries, decaying infrastructure and declining water quality. While California is on track to reduce carbon pollution due to our progressive climate and energy policies, our water challenges are the elephant in the room. So it was inspiring to attend a daylong event convened by the Pacific Institute in Los Angeles, where leading corporate, nonprofit and technical water experts honed in on water stewardship and shared innovative solutions to the business and environmental challenges we face with regard to water scarcity. The companies represented there – including AT&T, Deloitte, MillerCoors and Veolia – see water scarcity as a current business risk, as well as a critical component to economic growth in California, the Colorado River Basin and around the world. The World Economic Forum even ranked water crises as the third most pressing global risk for 2014. “Often, the greatest risks come from conditions over which the company has the least influence,” noted Jason Morrison of the Pacific Institute, whose Water Action Hub offers a powerful guide with tools and resources for collective action. To mark the 44th Earth Day, EDF has released a new Green Roads map celebrating clean transportation, an economic sector that is helping the Earth by producing groundbreaking and sustainable technologies. We Californians like to drive, but unfortunately our dependence on petroleum is harming our state, giving us the nation’s most polluted cities and the state’s biggest contributor to climate pollution (see the graph). Refrigerants are modern day inventions that allow us to keep our ice cream cold and our homes comfortable. These gases are used everywhere from kitchen refrigerators to cooling systems in grocery stores and food warehouses to air conditioning in homes, office buildings, data centers, and cars. While refrigerants have become essential to modern society, most are very harmful to the environment when released into the atmosphere. Refrigerants such as chlorofluorocarbons (CFCs) and hydrofluorocarbons (HFCs), also known as F-gases, are greenhouse gases thousands of times more potent than carbon dioxide. Who: EOS Climate was founded in 2008 and has more than 20 full-time employees. 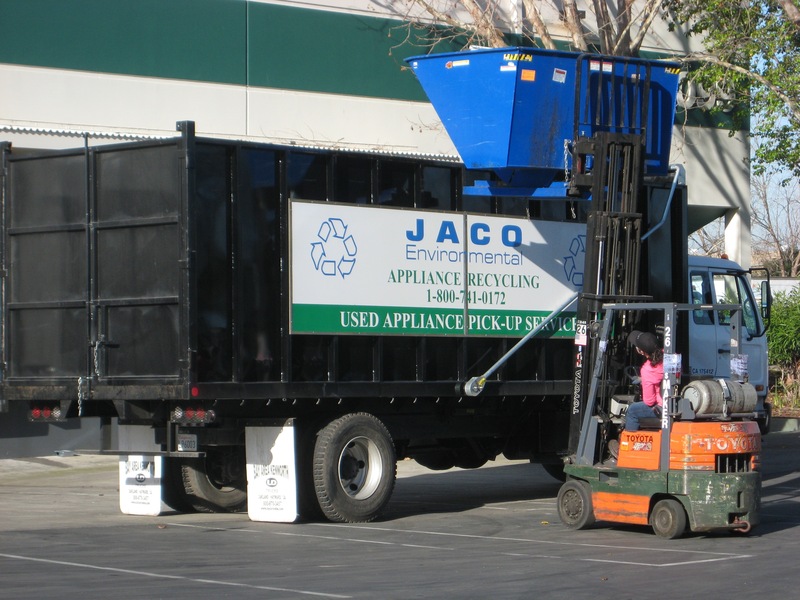 JACO Environmental is a leading appliance recycler in the U.S., with a network of over 30 collection facilities around the country, including two in California that employ 60 people. What: EOS creates economic incentive for companies to responsibly manage refrigerants across their lifecycle. In partnership with JACO and other global sustainability leaders, EOS is preventing emissions of millions of tons of greenhouse gases. Where: EOS is headquartered in San Francisco. JACO has facilities in Hayward and Fullerton. Why: EOS aims to transform business as usual by treating refrigerants as financial assets rather than consumables. AB 32 has given EOS a foundation for this business innovation and economic opportunity. Over the past 50 years, global population and economic growth has resulted in a dramatic increase in demand for refrigeration and air conditioning worldwide. As a result, a significant amount of leaked refrigerants have reached the atmosphere. Further, the common practice of sending retired equipment to recycling centers and landfills, many of which are not equipped to properly dispose of refrigerants, has meant that most refrigerants are released during end-of -life practices. EOS Climate and JACO Environmental are aiming to solve this problem. 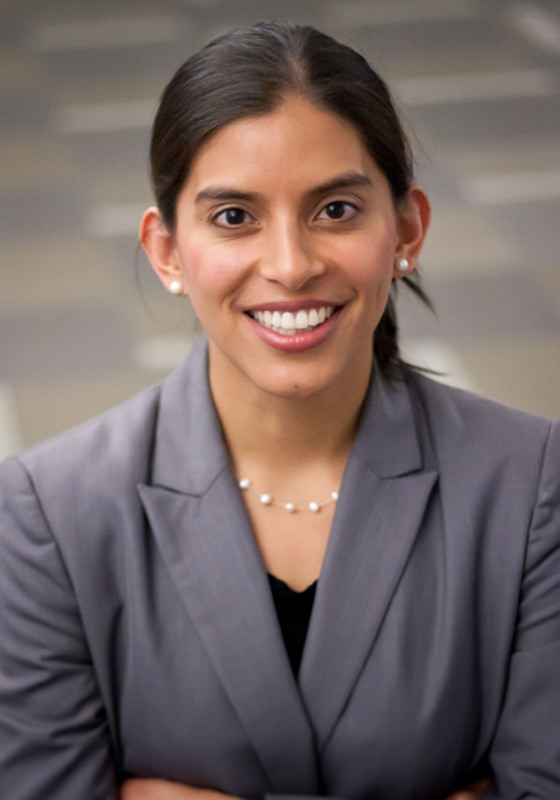 Based in San Francisco, EOS Climate was founded in 2008 by Presidio Graduate School classmates Jeff Cohen, Todd English, and Joe Madden, as an outgrowth of their MBA program in Sustainability Management. Their idea was to create economic value for organizations that properly manage refrigerants and other F-gases. 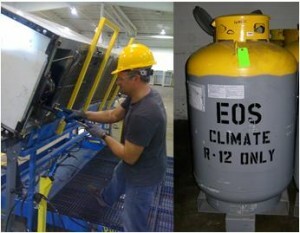 EOS’s solution was to develop a scalable system to recover and destroy CFC refrigerants from older equipment, which could be financed through the generation and sale of Verified Emission Reductions in California’s cap-and-trade program under the Ozone Depleting Substances offset protocol. By working through AB 32, EOS has avoided millions of tons of greenhouse gas emissions, bolstered California’s recycling industry, and helped accelerate a transition toward more climate-friendly technologies. With venture backing from Firelake Capital and partnerships with companies like JACO Environmental, CleanHarbors, and Hudson Technologies, EOS is proving that AB 32 gives companies the tools to make fighting climate change a winning business model. One sector that EOS has seized upon is appliance recycling. 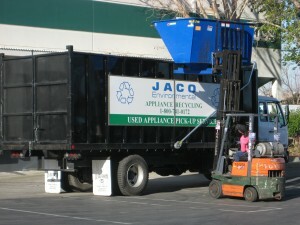 By working with JACO Environmental, they are changing the way refrigerators are collected, handled, and recycled. In the partnership, JACO collects fridges and sends them to specialized facilities like the ones in Hayward and Fullerton. There, the fridges are taken apart and the refrigeration gases inside are sucked out, collected, cleaned, and measured. The gases are then further processed and transported to a certified destruction plant. According to JACO, the removal of a single aging refrigerator or freezer can prevent up to 10 tons of carbon dioxide equivalent gases from entering the atmosphere. EOS and JACO estimate that together they have prevented greenhouse gas emissions equivalent to taking 800,000 cars off the road annually. With their rising ‘Refrigerant Revolution’ Refrigerant Asset System, and a growing list of customers and partners, EOS Climate has created a business model that drives economic and environmental outcomes while helping the Golden State reach its aggressive climate goals and bolster its position as the global hub of innovation. In California, we’ve just marked the one year birthday of the state’s landmark cap-and-trade program, a market-based approach to reducing the Golden State’s carbon pollution to 1990 levels by 2020. EDF thinks it’s a pretty big deal, and we’re not alone: the program weighed in at number one on Time’s top 10 green stories of 2013. In lieu of cake and candles to celebrate the program’s first year and future potential, we’ve published the Carbon Market California: A Comprehensive Analysis of the Golden State’s Cap-and-Trade Program, Year One. This report is our comprehensive assessment of cap and trade’s inaugural year, and our analyses and interviews with market experts conclude that a strong, healthy, and enduring carbon market has emerged. 1. It’s a well-designed program off to a promising start. 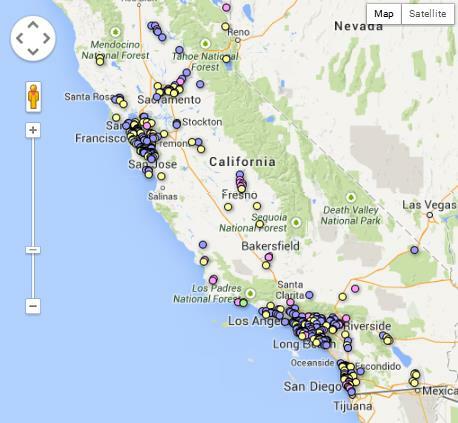 California has held five allowance auctions to date and they’ve all run smoothly. All emissions allowances usable for compliance in 2013 were sold, auction participation has been strong and allowance prices have remained stable and reasonable. In addition to successful quarterly auctions, a healthy secondary market over the first year suggests that regulated companies are purchasing allowances and thereby incorporating the cost of carbon pollution into their strategic planning. This successful start is due to a commitment to building a solid foundation of principles carried out under the highest of market standards. 2. With cap and trade in place, the California economy continues to recover. With a price signal now in place for emission reductions, regulated companies can flexibly decide how to reduce their pollution. In addition, clean energy companies and innovators are creating products and services that are transforming California to a clean energy economy. And money raised by the auctions will be invested in this clean energy future, and especially benefit communities hit hardest by climate change. 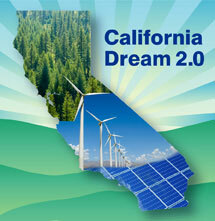 These investments will boost clean tech in California, improve air quality, and create jobs. 3. The foundation is set for a strong, long-term program. In 2015, California’s cap will more than double in size to cover 85% of the state’s economy and include transportation fuels, thus ensuring carbon pollution reduction from its largest source – transportation. And, there is already discussion in the state capital about the program’s future after meeting its goals by 2020. With these positive indicators, we’re confident cap and trade is here to stay. The continued success of this program will also show the world that cutting carbon can be done efficiently and affordably, while driving innovation and growing an economy that builds healthier – and more resilient – communities. 4. The world is watching…and is starting to act.The program is the most comprehensive and ambitious in North America, in both the sheer size of the state’s economy (the 8th largest in the world) and the number of sectors covered. Cap and trade is not only cleaning up California, it’s also serving as a model to build a comprehensive solution to the global climate crisis. If we want to move the needle on climate change, it will take a global community to make it happen. The state’s carbon market is an important step, and we hope other jurisdictions will follow our lead to create market programs of their own. In the past year alone, there are promising signs of collaboration beyond California’s borders: the Golden State has formed a series of important partnerships including linkage with Quebec, a non-binding agreement with Oregon, Washington state and British Columbia to establish a regional climate plan, a Memorandum of Understanding (MOU) with China which launched seven of its own pilot trading programs last year, and a MOU with Australia to guide collaboration in addressing climate change. With California as a shining example of what is possible, I’m confident that others will continue to join the fight. So, happy first birthday California cap and trade. May the years ahead be as bright as the first. While international climate discussions drag on in Warsaw, Poland, today’s milestone is further demonstration of the importance of California’s continued leadership on climate action, putting the world’s first economy-wide cap on emissions, and using a market mechanism to put a price on carbon. Today’s results cap off a successful year. As our one year report in January will show- the auctions have run smoothly, allowance prices have remained stable and reasonable, and compliance entities are participating. In addition, allowances are selling, official offsets have been issued, Quebec linkage will begin in under 2 months and legal uncertainty has been lifted. Congrats California, the positive momentum of your smart climate policies continues on both strong legal and policy footing. For the second auction in a row, all current and future allowances sold, demonstrating continued viability of the market and bringing total state auction proceeds to more than $530 million. That money must be invested in projects that reduce climate pollution, and at least 25%, or over $130 million to date, will provide clean energy opportunities to disadvantaged communities. This week 16,614,526 current (V13) allowances sold at $11.48 and 9,560,000 future (V16) allowances sold at $11.10. 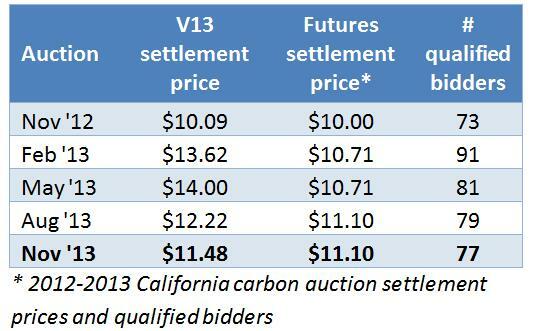 For V13 allowances, there were almost 2 times more credits bid on than were sold which demonstrates strong demand in the market. 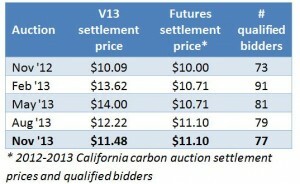 As was expected by analysts, the fifth auction showed a lower settlement price than in previous auctions. This is normal for end of year auctions as many of the covered entities have likely already purchased the allowances they need to cover their 2013 emissions targets. Still, the complete sale of allowances indicates participants are confident the market is here to stay and are serious about preparing for future compliance obligations. We are steadfast in ensuring that this first year is just the beginning; California’s cap-and-trade program and emission reduction goals remains robust, with life beyond 2020. As documented by the CalEPA, the impact of climate change is already affecting the state in the form of more frequent and intense wildfires, shrinking glaciers and snowpack, and hotter temperatures. In fact, 2013 is predicted to be the driest year ever recorded in California. With this data, we can’t afford not to reduce our emissions to avoid the worst impacts of climate change. As expected, cap-and-trade is a working solution. It is incentivizing the state’s dirtiest polluters to find innovative , low-cost solutions to reduce emissions and is garnering interest at home and around the world. In the spirit of the season, we are thankful that this first year of auctions has been remarkably successful; that the economy is recovering and that the state is on track to meet its 2020 emission reduction goals.